Happy August! It's time for July's monthly report. See past reports here. I think I'm finally starting to gain a little project momentum. I'm still mostly finishing small projects, but I finished up some quilt backs and got two quilts sent out for quilting. I also crossed the half-way mark on my scrappy pineapple blocks! 23 blocks to go. I love working on this project! 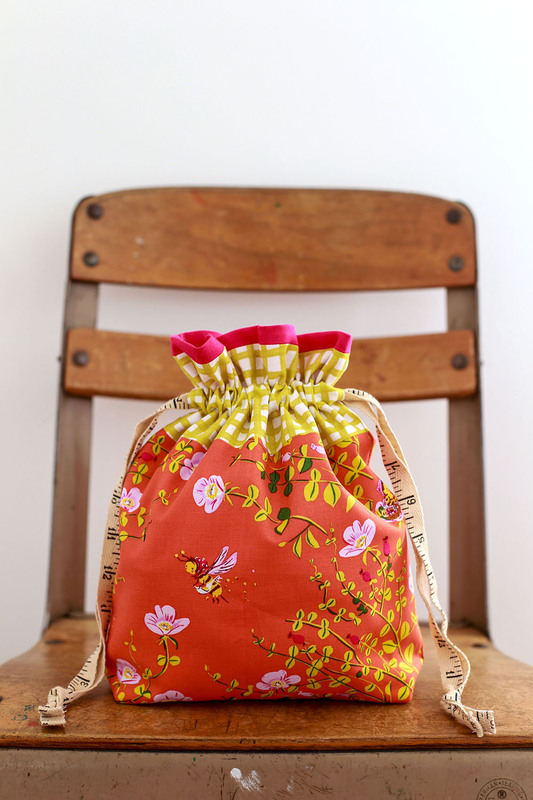 I've been stash diving lately, making things from some hoarded prints, including a few drawstring bags. For this one I used some Briar Rose, Daisy Chain, and Insignia fabrics. Plus some of my favorite ruler twill tape! This is the Everything size, which is the same as the tutorial size. I also stitched up a Project size drawstring bag using some barkcloth! I've never actually made anything with barkcloth, it was fun to work with. These colors and prints are so fun. The barkcloth is from In Theory, and the ties are made from my Curiosities print. I feel pretty good about this past month's fabric. This month was my second highest for used up fabric, and I didn't even finish a quilt! It was all from small projects. I brought in fabric for a new workshop tote (I'll be announcing the details for a sew along soon!) and then picked up some Terrestrial by Sarah Watson. I've had my eye on this collection since it was shown at Fall Market last year, so it was a long planned purchase. 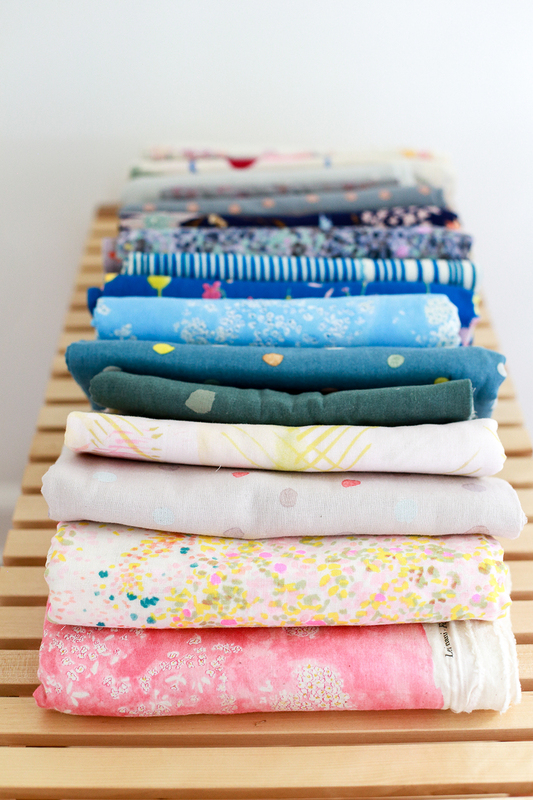 I also picked up some garment fabric remnants on sale from Imagine Gnats. Did a little thrifting this month and found another vintage sheet in the package! Always exciting when that happens, and this is a really good one! I am trying something new. I have been thinking about trying out needle-turn applique for a while and I finally decided to make a little test block to see if I like it. It's based on the Aerial Grove quilt from Savor Each Stitch by Carolyn Friedlander. My sweet George bunny. Always looking so adorable! I love your drawstring bags and you always do such a good job of photographing them - a skill I'm sadly lacking. Kisses to George bunny. Looks like it was a great month. Love your project bags!!! Every time I made one I would decide I loved it too much to sell and would keep it. That must be why I have about 10 hanging around? Congrats! on the "new" vintage sheet. SEW exciting!!! Knitter here. 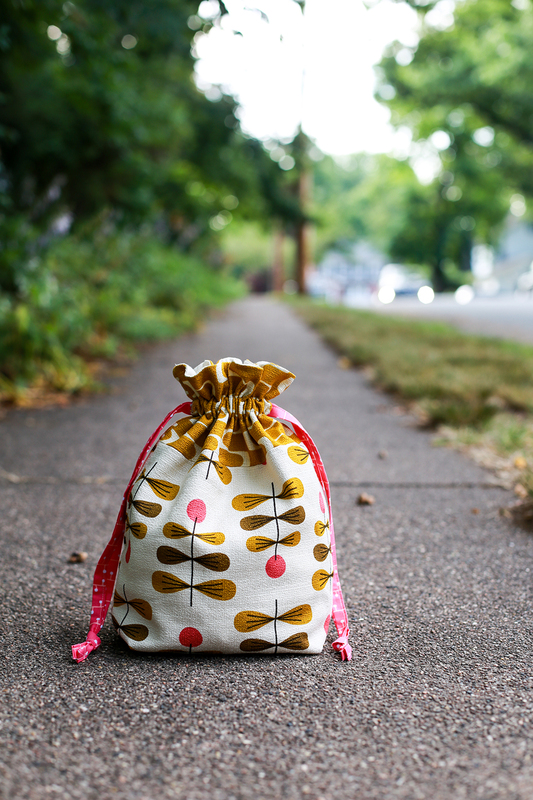 I adore the drawstring bags you made! George IS adorable and I love the way your Pineapple Quilt is shaping up. I've been wanting to make one too and I absolutely love that neon green you're using!